Back in 2014 Chopard introduced their first watch using Fairmined® gold, the standard for ‘fair mined’ having been determined in 2011 by the Alliance for Responsible Mining (ARM). At the time, I noted that some of the challenges faced by the lack of any single universal accreditation scheme for ethically mined gold, but since then, Chopard have continued to pursue this, and this can only be a laudable thing. In fact since July 2018, they have been using this gold for all their watches and jewellery. The ‘QF’ in the name stands for the Quality Fleurier certification that the brand receives from the Fleurier Quality Foundation. You can read about the criteria for meeting certification (and the Foundation) at this link. It is also COSC-certified. If you are interested in knowing what the Foundation’s other participating brands are, go to this link. This new limited edition (250 pieces) L.U.C. XPS Twist QF is a watch that falls into the classical mold of the L.U.C. family. 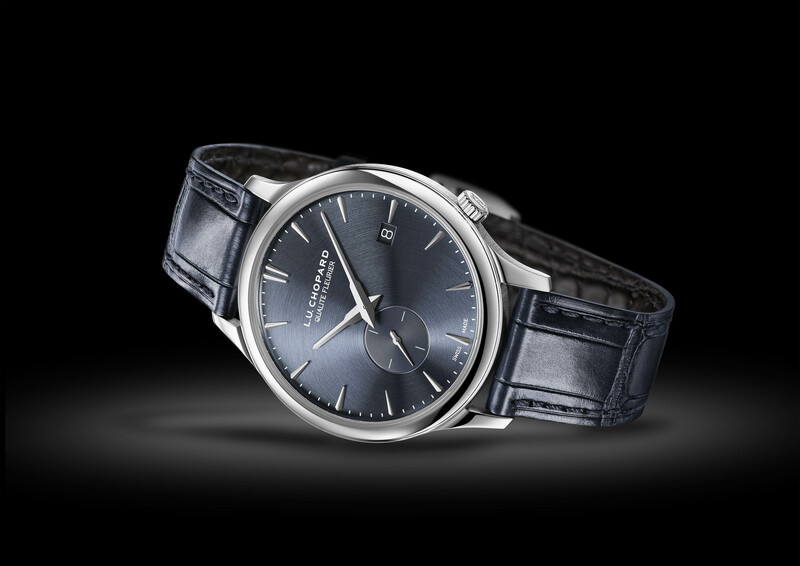 It features a dial with blue-grey galvanic treatment and a satin-finished sunburst motif. The offset seconds sub dial at 7 o’clock is a ‘Twist’ feature. Both sets of hands are rhodium-plated. The watch is powered by the automatic Calibre 96.26-L, which is a variation on Calibre 96.01-L but ‘offset’ by 30 degrees. With a 22 carat gold micro rotor and Chopard’s patented twin stacked barrels, it has sixty-five hours of power reserve and is a very slim 3.3mm thick. Size wise, the 18 carat Fairmined® white gold case is 40mm, and 7.7mm thick, and water resistant to 30m. The crown (also offset, at 4 o’clock), is also 18 carat white gold. It comes on a matte blue-grey alligator strap with an 18 carat white gold buckle. RRP will be around the 20,000 USD mark. As I mentioned at the outset, Chopard’s commitment to using ethical gold has becoming increasingly important to them, and it’s a commitment worth supporting. If you want to read more about what they are doing now and their plans, go to this page.